April 1, 2014 in Venezuela was no joking matter. 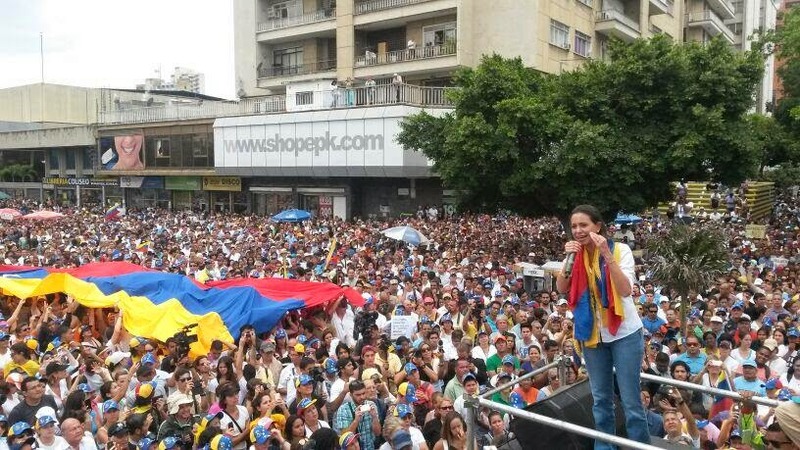 Two events on the same day demonstrated the human rights challenges facing the South American country: release of the Amnesty International report on Venezuela and María Corina Machado's nonviolent rally to demand admittance to the National Assembly where she is a member duly elected by the Venezuelan people. Beginning in Madrid in the late morning, Amnesty International released its report on the human rights crisis in Venezuela titled: Venezuela: Human Rights at risk amid protests and during the presentation of the report a number of tweets by the authors and researchers highlighted the situation. "Esteban Beltrán, provides data on arrests, deaths and wounded in protests in recent weeks in Venezuela." "Nuria García talks about field research and emphasizes that there are victims who fear speaking in Venezuela." 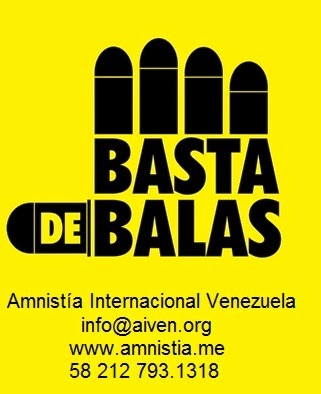 From Amnesty Spain: "We're concerned, by among other things, threat in residential neighborhoods, using rubber bullets and the abuse of detainees. From Amnesty Spain: We have received dozens of complaints from people who have been ill-treated in detention. 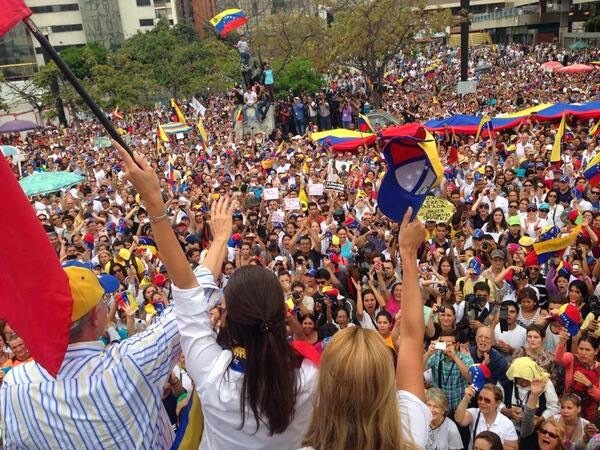 "The Bolivarian Police took advantage of the speeches by the politicians, surrounding the demonstration stealthily. At the end, they did not hesitate one second to launch the famous 'good gas'. "Strong repression", complaied the Metropolitan Mayor Antonio Ledezma, one of the closest allies of Machado. "They are desperate to see that they can not intimidate the brave people in the streets and repressed a peaceful demonstration," he added. Machado, accompanied by several opposition MPs and still suffering the effects of gas boarded a group of motorcycles and sped off towards the Assembly. On the stage small battle groups of people recovered from the effects of the gas. Students took to the streets to another area of ​​the city, ready to protest the umpteenth police crackdown as violent as ever." 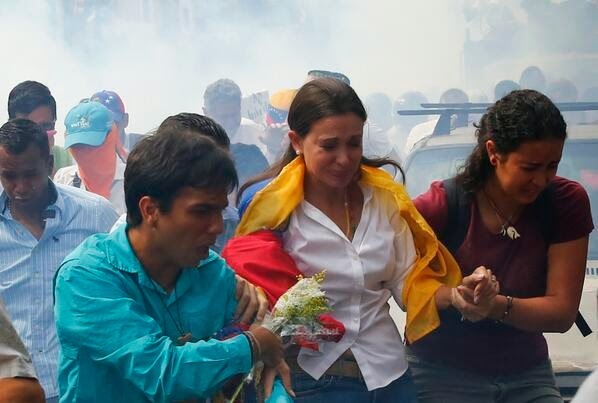 María Corina Machado was removed from office for having addressed the Organization of American States on the human rights crisis in Venezuela. Due to maneuvers of the Venezuelan government she was blocked from speaking and the government of Panama credentialed her to speak. The Chavista's used this as the basis to remove her from office in a manner that is unconstitutional and that was upheld by the Chavista packed Supreme Court. Venezuelans are being shot in the head, killed by snipers, for participating in nonviolent protests. 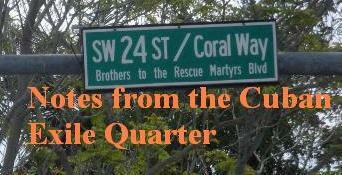 It appears that these killings are being carried out by government agents. Others have been tortured. Their is reason to this brutality and it did not appear out of the blue. In 2004, displeased with a series of controversial judicial rulings, the president and his supporters in the National Assembly launched a political takeover of the Supreme Court. They enacted a new law expanding the court from 20 to 32 members. Since the law allowed the legislature to select new members by simple majority vote, this meant the governing coalition was able to use its then slim majority in the National Assembly to obtain an overwhelming majority of seats on the court. (At the time the court was believed to be evenly divided between Chávez allies and critics.) The law also gave the National Assembly the power to remove justices from the bench with a simple majority vote rather than the two-thirds majority required by the 1999 Constitution. The law, in short, made it possible for the governing coalition to both pack and purge the country's highest court. ... Within weeks of the law's enactment, the three Supreme Court justices responsible for the rulings that had most angered the Chávez camp were gone from the bench. In December 2004 the governing coalition in the National Assembly filled their vacancies, as well as the 12 new seats, with political allies. Over the next few years, this packed Supreme Court fired hundreds of lower court judges and appointed hundreds more to permanent judgeships. The political takeover of the Supreme Court effectively neutralized the judiciary as an independent branch of government. The packed court has largely abdicated its role as a check on arbitrary state action. When the Chávez government has pursued measures that undermine human rights protections, the court's response has typically been one of passivity and acquiescence. It has failed, in particular, to counter assaults on the separation of powers, such as the 2004 court-packing law and, more recently, a 2007 constitutional reform package. It has also failed to safeguard fundamental rights in prominent cases involving the media and organized labor. In recent years, justices on the packed Supreme Court have openly rejected the notion of the judiciary as an independent branch of government. Instead of serving as a check on arbitrary state action, they have espoused the view that the role of the country’s courts is to support the political agenda of President Chávez. Judge Afiuni was detained on December 10, 2009, the day she authorized the conditional liberty of Eligio Cedeño, a banker accused of corruption, on the basis that he had been in pretrial detention for almost 3 years, despite the 2-year limit prescribed by Venezuelan law. The UN Working Group on Arbitrary Detentions had declared Cedeño’s detention “arbitrary.” The authorities accused Afiuni of corruption, abuse of authority, and “favoring evasion of justice.” On December 11, President Hugo Chávez said Afiuni was a “bandit” and should be sentenced to 30 years in prison. Cedeño fled Venezuela and requested political asylum in United States a few days later. A few days later, [Chávez] said she was “correctly jailed” and reiterated that she should be given a maximum sentence, adding that he “would give her 35 years.”In January 2010, prosecutors charged Judge Afiuni with corruption, abuse of authority, and “favoring evasion of justice.” Prosecutors provided no credible evidence to substantiate the charges. Judge Afiuni was held in prison for over a year, before being transferred to house arrest.During her detention, Judge Afiuni was raped and suffered physical and psychological violence, including death threats from other inmates.In June 2013, Judge Afiuni was released on bail, while her trial, which began in 2012, continues. We recall that the UN Basic Principles on the Independence of the Judiciary prohibit inappropriate or unwarranted interferences with the judicial function, including through reprisals such as those perpetrated against Judge Afiuni. Where the judiciary is subordinated and controlled by the executive branch one of the main pillars of a democracy: the rule of law has been removed. In 2014 the end result of the weakening of Venezuela's democratic institutions has reached the point that it is at a tipping point into a totalitarian dictatorship. Freedom of the press has been curtailed and government institutions that should be independent are all centralized in the executive. The democratic resistance has only one outlet to demonstrate its opposition in Venezuela and that is to take to the streets demanding that its rights are respected. The response of the Maduro regime with their Cuban advisors is to try to terrorize nonviolent protesters with violence, killings and torture. Imprisoning nonviolent opposition leaders such as Leopoldo Lopez has failed to shutdown the nonviolent demonstrations. From behind bars Leopoldo has been able to call thousands to the street in defiant and nonviolent protest. "They will not silence us. Now more then ever, I am a member of the National Assembly and assume my responsibility to be Venezuelan's voice in and out of the National Assembly." In Plaza Brión: "We demand the the Attorney General's resignation, we demand real Electoral Authority." In Plaza Brión:"We will not give up, because our struggle is for human dignity." In Plaza Brión: "My job as your Member of the National Assembly I have done in the streets with you and I will continue there until we overcome."